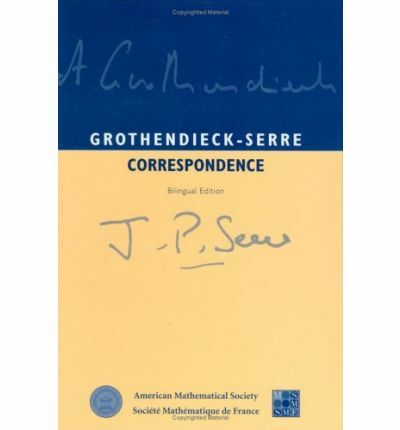 This extraordinary volume contains a large part of the mathematical correspondence between A. Grothendieck and J.P. Serre. It forms a vivid introduction to the development of algebraic geometry during the years 1955-1965. During this period, algebraic geometry went through a remarkable transformation, and Grothendieck and Serre were among central figures in this process. In the book, the reader can follow the creation of some of the most important notions of modern mathematics.The letters also reflect the mathematical and political atmosphere of this period. They are supplemented by J-P. Serre's notes, which give explanations, corrections, and references to further results. The book is a unique bilingual (French and English) volume. The original French text is supplemented here by the English translation, with French text printed on the left-hand pages and the corresponding English text printed on the right. The book also includes several facsimiles of original letters. The original French volume was edited by Pierre Colmez and J-P. Serre. The English translation for this volume was prepared by Catriona Maclean with the assistance of Leila Schneps and J-P. Serre. The book should be useful to specialists in algebraic geometry, mathematical historians, and to all mathematicians who want to experience the unfolding of great mathematics.